If you are looking for a bridal make-up artist for your wedding, look no further than the fabulously creative Gem Ryder MUA. Every bride wants to look and feel amazing on her wedding day. With Gem’s skill and expertise, you can achieve your desired look. Gem uses only the best high-end products, providing you with a quality service that’s professional, friendly and competitively priced. We have worked together on a number of shoots and have always been impressed with the end result. 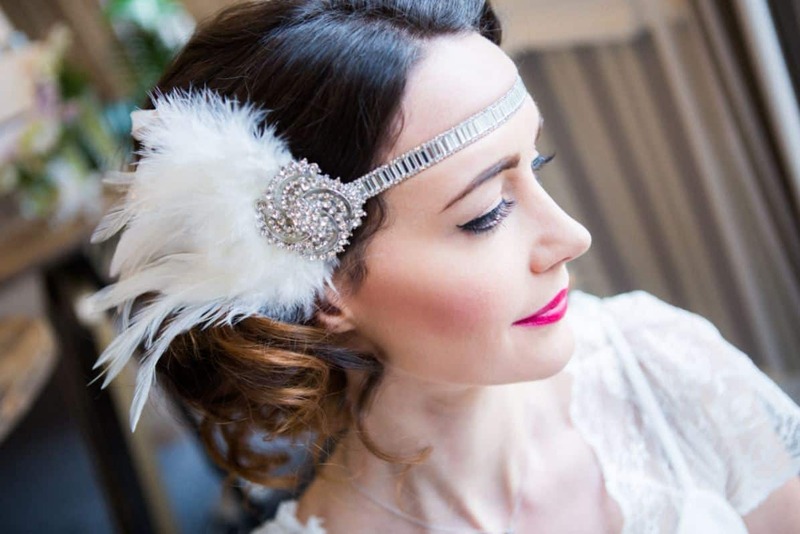 Here are just some photos from the 1920s inspired shoot with UpArt Photography. Gem also created the bridal look for our English Tea Party shoot in June with UpArt Photography (photos to be revealed shortly!). Thank you for taking the time to talk to us. How did you start Gem Ryder MUA, had it always been your dream to run your own business? I started the business after I had given up working full-time when I had my little boy Noah. I’d been a stay-at-home mum and loved it, but also wanted something for myself. I had always had an interest in make-up. And after a friend asked me to do her make-up for her wedding, I realised how much I enjoyed being a part of someone’s special day. It was after this experience that I started the business and it has gone from strength to strength. I absolutely love running my own business and being in control of my own destiny. I also like knowing that I am the only person responsible for my successes. Did you have any professional training? I trained at the Academy of Freelance Makeup in Soho, London. It was really important to me to learn about all aspects of bridal makeup. That included maintaining good hygiene and creating the perfect look, as well as tips and tricks for dealing with a wide range of people, skin types, skin concerns, etc. I continue to update my training with AOFM by attending masterclasses run by leading industry experts and brands when I am able. Tell us about the services you offer, and your specialities. I specialised in bridal make-up and offer a full range of make-up services for weddings, proms, special occasions and photo shoots, both personal and commercial. Lasting the distance is probably the most important thing when considering bridal make-up. So I work only with the best products that I know from experience offer great longevity. No bride wants to be worrying about whether her make-up is disappearing half way through her day. I also give a pot of lipstick to all my brides for their wedding day. This is something that definitely needs topping up – no lipstick is food, drink and snog proof! I also pride myself on offering excellent customer service. I always try to get back to people as quickly as I can and try to be as flexible as possible with regards to trials dates, etc. Also, I’m known to go beyond my make-up artist role on the wedding day. You’ll often find me buttoning/lacing dresses and shoes, opening champagne, attaching buttonholes, tying ties and fixing broken dresses (I have stitched a bridesmaid into her dress). I have even climbed under dresses to put on forgotten garters – if I can help I will! How many people are you able to make over on the morning of a wedding? The number of people I am able to work with on the morning of a wedding is largely dependent on the time of the ceremony. I do have a colleague (April Wagner) that I work with regularly. Together we are able to offer a wider range of services to more people then we can do independently. Are there any current trends in bridal make up? There are trends in bridal make-up, although we see these far less then in the fashion industry. For a while now we have been using a heavy contour and highlight. Whilst this works for some people, I find that most brides want a timeless, classic look that won’t date. I believe it is far better to make choices that are best suited to you – your skin tone, hair colour, eye colour, etc – and to make the most of your natural features. It’s also important to create a look that is going to last you all day so you don’t have to worry about touching up. I also think that following the wedding of Prince Harry and Meghan Markle earlier this year, we will see a move back towards a more natural, understated look. Make-up that will complement the entire bridal look, not overshadow it. Do you offer a trial prior to the wedding? I always recommend a trial around 6-8 weeks prior to the wedding day. This gives me and the client a chance to meet and discuss their make-up before the big day. And we can try out a couple of different looks if needed. It means that the client is 100% confident in the make-up and gets a chance to see how well it will last so they have no worries on the wedding day. Every year I work with a number of brides who don’t live locally, or even live abroad, and so are unable to have a trial. In these instances I have additional contact via email/Skype so we can discuss options before the wedding. We also allow extra time on the morning of the wedding to have these discussions. It is so important to be prepared for your trial to have an idea of what you like or don’t like. It’s useful to see photos of make-up looks you might like to try, but also to be open to suggestions. Do you have a favourite look that you have created to date? My most favourite look I have created to date is actually a duo of looks that I worked on for a photo shoot called Light Vs Dark. We took a single model and created two very different looks for her. This showed how different you can make a person look and feel with simple styling choices. Here are the results – I don’t think you would even necessarily realise it was the same person. We even saw a huge change in the way the model held herself and walked when we changed her look. So I think we manged to fulfil the brief even more than we could have expected to. Do you have any exciting plans for the future? I am going to continue to build my business, stay true to myself and offer excellent customer service. I may have a couple of things up my sleeve but you are going to have to stay tuned to find out. For more information, visit Gem Ryder MUA’s website.